Recently collated statistics from organisers Dundee Science Centre reveal that just over 39,000 people attended its 112 events during the two-week city-wide celebration, which ran from 1-16 November 2014. The huge number of participants attended a combination of schools events, public events and exhibitions compared to just over 8,000 taking part in 2013. One loyal festival fanatic attended a total of 30 events! As well as Dundee residents, people also travelled to the festival’s 20 venues from Perthshire, Angus, Fife and beyond. The festival, which ran from Saturday 1 until Sunday 16 November 2014, is a two-week city-wide celebration of science, providing fun, entertainment, inspiration and curiosity for all ages. Festival audiences enjoyed everything from the world of forensic science and dementia to the science of whisky and the wonders of the night sky. Meanwhile, families tried their hands at making bat boxes, building brush robots and getting fully immersed in science at free family days at Dundee Science Centre. 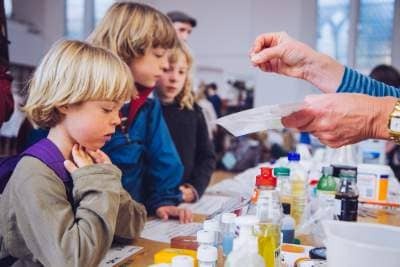 For more information on Dundee Science Festival, visit http://www.dundeesciencefestival.org.uk or email dundeesciencefestival@dundeesciencecentre.org.uk or telephone 01382 228800.